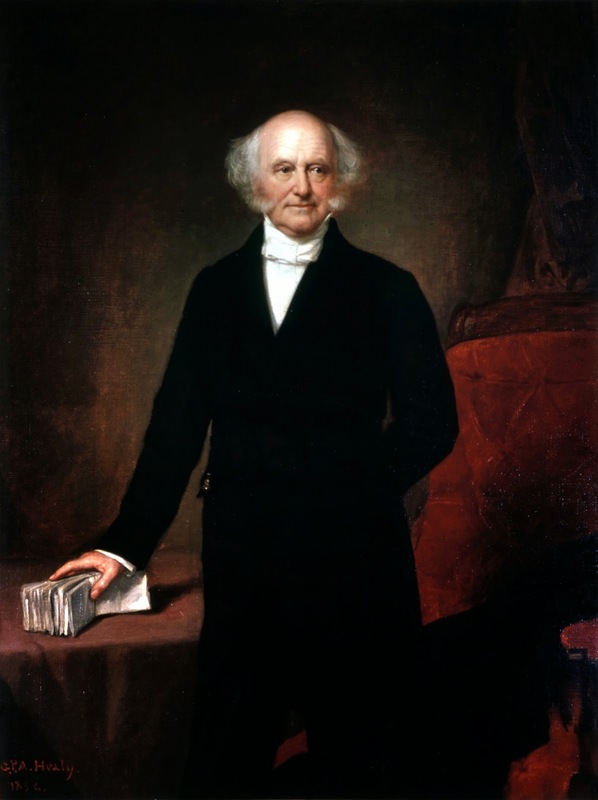 Martin Van Buren, the 8th President of the United States, was known by many nicknames. Perhaps the most well known was "Little Magician." "Little" is believed to have referred to both Van Buren's weight as well as his height. Although Van Buren was considered a slender man, there was speculation during his day that he might have utilized a corset or two to achieve his slim appearance. Congressman Davy Crockett went so far as to bring Van Buren's gender into question when he leveled, "[Van Buren] is laced up in corsets, such as women in a town wear, and, if possible, tighter than the best of them. It would be difficult to say, from his personal appearance, whether he was a man or woman, but for his large red and gray whiskers." Naturally slim or corset-wearer? You decide. Like Van Buren's figure, his relative height is also up for debate. Van Buren stood 5'6, which undoubtedly is short by today's standards. Van Buren would also be considered short compared to his predecessors in the office of President - whose average height was 5'10. Yet, Van Buren was only between one and two inches shorter than the average American male born during his era. Van Buren may very well have deserved the second half of his moniker - "magician." Throughout his service as Congressman, Vice President, and President, Van Buren always seemed to be involved in the machinations of party politics across the country. Despite his omnipresence, Van Buren was given a second and more unfortunate nickname of "Martin Van Ruin," by his political opponents. Van Buren took office 5 weeks prior to the Panic of 1837 and was criticized for his laissez faire attitude towards the financial crisis. His detractors claim that the depression would neither have dragged on for five long years or been as severe had Van Buren supported government intervention in the economy. Funny how government intervention in the financial markets was a hot topic for debate some 170 years prior to the 2008 financial crisis. Van Buren's final nickname, "The Red Fox of Kinderhook," is similar to "Little Magician" in that it addresses Van Buren's physical appearance as well as political acumen. As Davy Crockett pointed out in his aforementioned attack on the eighth president's waistline and gender, Van Buren was indeed red-haired. Although both "silver fox" and "red fox" refer to hair color, the similarities end there. While "fox" in the former context refers an attractive middle-aged male, in the Van Buren's case it designates political prowess. Lastly, "Kinderhook" refers to his place of birth: Kinderhook, New York. Perhaps this was included to emphasize that Van Buren was the first President to be born an American citizen. Or maybe "Kinderhook" just sounds cool.